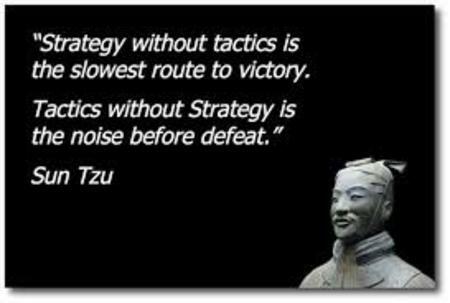 In 500 B.C., Sun Tzu, the Chinese military general, strategist and philosopher who wrote The Art of War said you can’t win a war without a strategy and tactics. Why? Great tactics win battles but great strategies win wars. That wisdom is just as applicable today. Whether it’s war, marketing, sales, research, business intelligence or personal, both are inextricably linked and co-dependent. Sometimes, when people are creating a plan, there is confusion about whether something is a strategy or tactic. It’s important to know. As Sun Tzu states, the wrong application can influence the outcome. Strategy or tactic? Here are 21 ways to tell the difference. Did this explain the differences between strategy or tactic to you? Does it help you with your plans? Are you applying them in the right way? 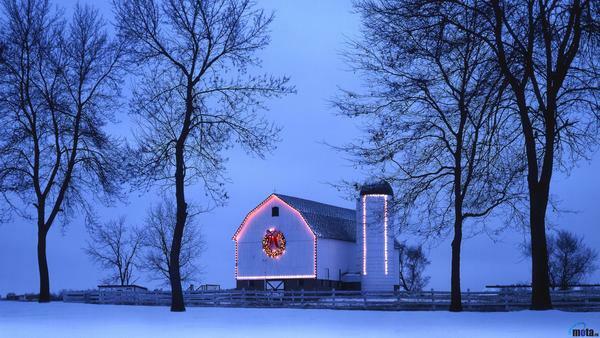 Happy Holidays from all of us at BarnRaisers. May the New Year unfold everything you hope it does. The Christmas Spirit is about expressing extra tolerance, charitableness and giving, especially to those who have had a difficult year or are going through trying times. And to be focused on a bright future. Perhaps, by learning a little more about Christmas, it will give us an appreciation to express this spirit now and in the New Year. Here are 47 facts about Christmas that will surprise you. The Bible doesn’t mention when Jesus was actually born. Most historians believe it was the Spring because of shepherds herding animals. December 25 was probably chosen because it coincided with the ancient pagan festival Saturnalia, which celebrated the agricultural god Saturn with partying, gambling, and gift-giving. On Christmas Eve during World War I, Allied troops took a break from fighting to sing Christmas Carols. When German soldier emerged they all shook hands exchanging greetings and cigarettes. It was called the Christmas Truce of 1914. Every year since 1947, the people of Oslo, Norway have given a Christmas tree to the city of Westminster, England. The gift is an expression of good will and gratitude for Britain’s help to Norway during World War II. Since 1971, the Province of Nova Scotia has presented the Boston Christmas tree to the people of Boston, in gratitude for the relief supplies received from the citizens of Boston after a ship exploded in 1917 following a collision in the Halifax, Nova Scotia Harbor. Part of the city was leveled, killing and injuring thousands. Because of its roots in pagan festivals, Christmas was not immediately accepted by the religious. In fact, from 1659 to 1681, it was illegal to celebrate Christmas in Boston. You were fined if you were caught celebrating. Christmas in early America was inconsequential. After the Revolutionary War, Congress didn’t even bother taking the day off to celebrate the holiday, deciding instead to hold its first session on Christmas Day, 1789. In 1856 Franklin Pierce, the 14th President of the United States, was the first President to place a Christmas tree in the White House. Teddy Roosevelt banned the Christmas tree from the White House for environmental reasons. Rudolph the Red-Nosed Reindeer got his start as an advertising gimmick. A copywriter named Robert L. May first created the merry misfit in 1939 to lure shoppers into the Montgomery Ward department store. Rudolph almost didn’t have a red nose either: At the time, a red nose was a sign of chronic alcoholism and Montgomery Ward thought he would look like a drunkard. Though Santa Claus has worn blue and white and green in the past, his traditional red suit came from a 1930s ad by Coca Cola. Frosty the Snowman was made famous by a whiskeymaker in 1890 who used Frosty’s likeness to showcase an entirely different kind of holiday cheer. Once Prohibition ended, Frosty quickly became the go-to guy for alcohol ads, appearing in posters for Miller beer, Jack Daniel’s, Ballantine ale, Rheingold beer, Schlitz beer, Schenley, Oretel’s lager beer, Chivas Regal scotch, Fort Pitt pale ale, Mount Whitney beer and Four Roses. Mistletoe is magical according to Celtic legend. It can heal wounds, increase fertility, bring good luck and ward off evil spirits. The tradition of kissing under the mistletoe began the Victorian era, surprising (or maybe not) considering the stuffy and sexually repressive behavior of the time. The use of evergreen trees to celebrate the winter season occurred before the birth of Christ. Germans decorated evergreen trees to brighten the dark, gloomy days of the winter solstice. The first “Christmas trees” appeared in Strasbourg in the 17th century and spread to Pennsylvania in the 1820s with the arrival of German immigrants. Approximately 30-35 million real (living) Christmas trees are sold each year in the U.S.
98 percent of all Christmas trees are grown on farms, while only 2% are cut from the wild. Most Christmas trees are cut weeks before they get to a retail outlet. It is important to keep them watered thoroughly when they reach your home. In the first week, a Christmas tree in your home will consume as much as a quart of water per day. The earliest known Christmas tree decorations were apples. At Christmastime, medieval actors would use apples to decorate paradise trees (usually fir trees) during “Paradise Plays,” which were plays depicting Adam and Eve’s creation and fall. In Finland, Finns visit saunas on Christmas Eve. In Portugal, Portuguese revelers hold a feast on Christmas Day for the living and the dead (extra places are set for the souls of the deceased). In Greece, some believe that goblins called kallikantzeri run wild during the 12 days of Christmas, and most Greeks don’t exchange presents until Jan. 1, St. Basil’s Day. In Australia and New Zealand, most Australians and New Zealanders enjoy Christmas on the beach or at barbecues. Each year more than 3 billion Christmas cards are sent in the U.S. alone. In Poland, spiders or spider webs are common Christmas trees decorations because according to legend, a spider wove a blanket for Baby Jesus. In fact, Polish people consider spiders to be symbols of goodness and prosperity at Christmas. Alabama was the first state in the United States to officially recognize Christmas in 1836. Christmas wasn’t declared an official holiday in the United States until June 26, 1870. Oklahoma was the last U.S. state to declare Christmas a legal holiday, in 1907. The poinsettia is native to Mexico and was cultivated by the Aztecs, who called the plant Cuetlaxochitl (“flower which wilts”). For the Aztecs, the plant’s brilliant red color symbolized purity, and they often used it medicinally to reduce fever. Contrary to popular belief, the poinsettia is not poisonous, but holly berries are. Santa Claus is based on a real person, St. Nikolas of Myra (also known as Nikolaos the Wonderworker, Bishop Saint Nicholas of Smyrna, and Nikolaos of Bari), who lived during the fourth century. Born in Patara (in modern-day Turkey), he is the world’s most popular non-Biblical saint, and artists have portrayed him more often than any other saint except Mary. There are two competing claims as to which president was the first to place a Christmas tree in the White House. Some scholars say President Franklin Pierce did in 1856; others say President Benjamin Harrison brought in the first tree in 1889. President Coolidge started the White House lighting ceremony in 1923. President Teddy Roosevelt, an environmentalist, banned Christmas trees from the White House in 1912. There are approximately 21,000 Christmas tree farms in the United States. In 2008, nearly 45 million Christmas trees were planted, adding to the existing 400 million trees. Christmas is a contraction of “Christ’s Mass,” which is derived from the Old English Cristes mæsse (first recorded in 1038). The letter “X” in Greek is the first letter of Christ, and “Xmas” has been used as an abbreviation for Christmas since the mid 1500s. The first person to decorate a Christmas tree was reportedly the Protestant reformer Martin Luther (1483-1546). According to legend, he was so moved by the beauty of the stars shining between the branches of a fir tree, he brought home an evergreen tree and decorated it with candles to share the image with his children. Christmas purchases account for 1/6 of all retail sales in the U.S.
he first batch of eggnog in America was crafted at Captain John Smith’s Jameston settlement in 1607, and the name eggnog comes from the word “grog,” which refers to any drink made with rum. “Jingle Bells” was originally supposed to be a Thanksgiving song. These facts were curated from articles by Time, Random History, Entertainment Tonight and University of Illinois Extension, with gratitude and appreciation for helping me gain a deeper understanding of Christmas and the Christmas Spirit. Did they do the same for you? This succinct truth says you can’t know whether you are reaching your goal unless success is defined and tracked. Data visualization is technology that lets corporate executives and other end users see data to better understand information in context. Hundreds of tools are now available to chart, create dashboards and better measure and mange data. They range in price from open source to thousands of dollars per year. They range is sophistication from “drag and drop,” plug-ins and widgets to java script that is likely to involve a web developer. The growth of data visualization says a mix of data and narrative is now a better way for businesses to tell their story. What measures are most important to manage? 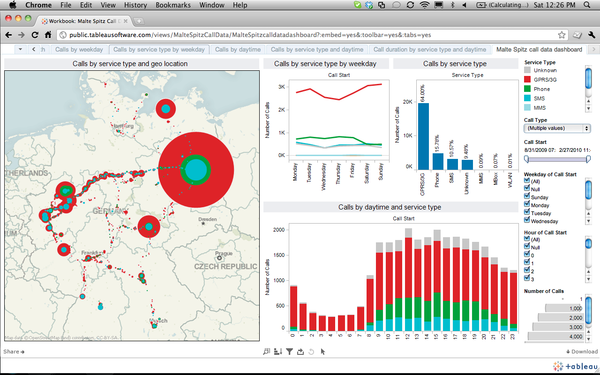 Once you’ve answered these questions, here are 14 of the best data visualization tools. They are grouped by categories to help you be a better storyteller with data. COLOR BREWER: Originally designed with federal funding and developed at Penn State — is really for choosing map colors, and is worth spending some time with if plan to make many more. You can choose your base color and get the codes for the entire palette. EXHIBIT: Developed by MIT, and fully open-source, Exhibit makes it easy to create interactive maps, and other data-based visualizations that are orientated towards teaching or static/historical based data sets, such as flags pinned to countries, or birth-places of famous people. TIMELINE: Is a fantastic widget which renders a beautiful interactive timeline that responds to the user’s mouse, making it easy to create advanced timelines that convey a lot of information in a compressed space. Each element can be clicked to reveal more in-depth information, making this a great way to give a big-picture view while still providing full detail. HERE IS TODAY: is a great example of an interactive timeline which continues to zoom out to give relative times all based on today. It seems simple, but is an example of several good aspects of data visualization design. It compares today with a month, then a year, then century, etc. It isn’t overwhelming the reader with all the data at once, or forcing the person to choose only one interpretation. TIMEFLOW: Allows you to create time-based diagrams easily and quickly. Designed for journalists, it allows for a variety of different ways to visualise the data and help you understand any underlying trends. 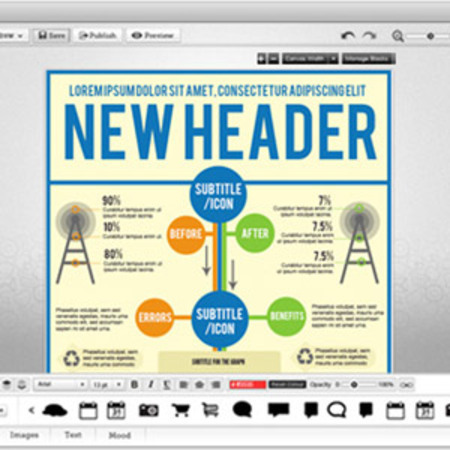 VISUAL.LY: Is a combined gallery and infographic generation tool. It offers a simple toolset for building stunning data representations, as well as a platform to share your creations. This goes beyond pure data visualisation, but if you want to create something that stands on its own, it’s a fantastic resource and an info-junkie’s dream come true. PIKTOCHART; Is a web-based tool that has good free themes and a whole bunch more for the paid version) for creating simple visualizations. You can drag and drop different shapes and images, and there is quite a bit of customization available. You can also add simple line, bar, and pie charts using data from CSV (or manual entry). The invfographic in our previous blog, 6 more studies prove Digital Marketing ROI was created with Piktochart. GOOGLE CHARTS: The seminal charting solution for much of the web, Google Charts is highly flexible and has an excellent set of developer tools behind it. It’s an especially useful tool for specialist visualizations such as geocharts and gauges, and it also includes built-in animation and user interaction controls. NVD3: Is a library meant for reuse. The project takes all the power of D3 and distills them down into common chart types. I really like this idea because it gives you constrains and prevents you from running wild with different designs, while at the same time making the code much easier and more approachable if you are just getting started in data visualization. TABLEAU: Places great emphasis on the ability to create visualizations without the need for any technical skills (scripting). and has a relatively easy to use interface. As with other products of this nature its utility is firmly anchored in visual exploration of data using every format imaginable. It is not a data mining tool or a text analytics tool, but sits in the traditional business intelligence camp, albeit with a rich visual interface. 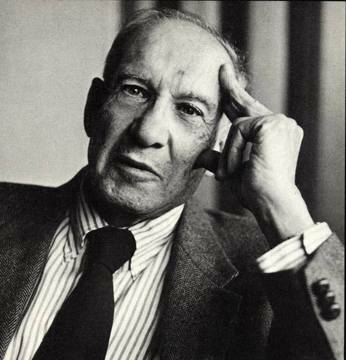 BarnRaisers are big believers in the wisdom of Peter Drucker and practitioners in data visualization. Let us show you how we use them to better tell the s story of your business and achieve your goals. 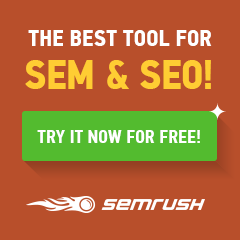 Which of these 14 tools are of interest to you? Do they convince you of the power of data visualization? Do you want to use them better tell the story of your business? 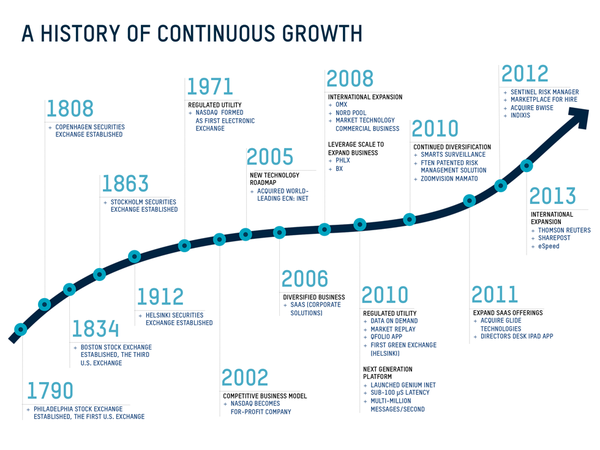 The facts indicate company leaders believe understanding data is a critical component to business growth. And more of it is coming at us in ever increasing rates. Data visualization is the art and practice of gathering, analyzing, and graphically representing empirical information. 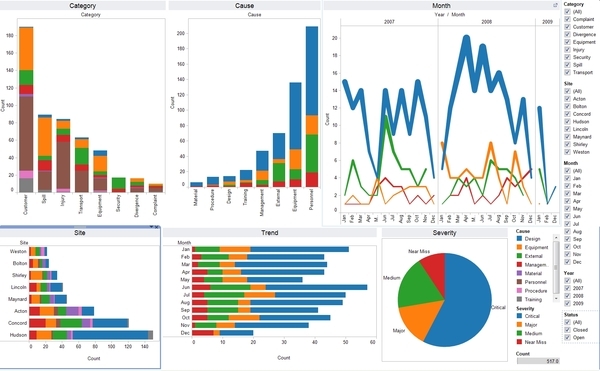 More and better data visualization tools have come to market from software services like Tableau, Fusion Charts, Google Charts and Visual.ly to help better display data. So, there is no reason business leaders shouldn’t be able to fulfill their data dreams. But it’s not the data. It’s what you do with it. Software doesn’t find the insights in the data, people do. Before companies jump into Big Data, they should be asking: Have we mastered the principles of little data? 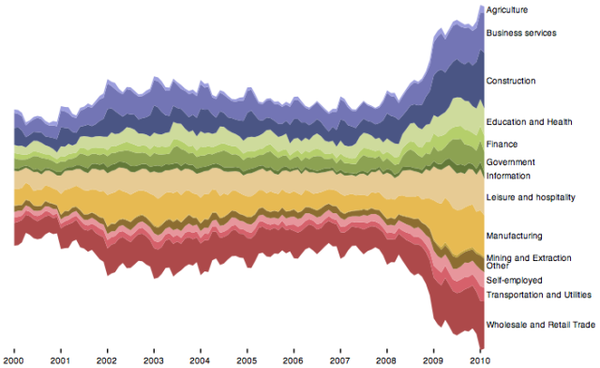 To help, here are 8 guidelines for great data visualization. BEGIN WITH BASIC DATA PRESENTED AS SIMPLY AS POSSIBLE: Great data visualization begins with measurements that are readily available, come from a reliable source and are easy to understand. For example, the line chart below for a coffee shop chain uses just profits by key beverage and time. 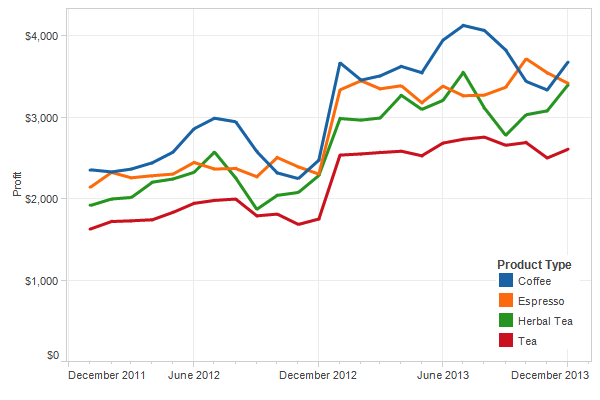 But it shows very clearly what types of drinks are going to be the most profitable and when. It gives all the information the owner requires to order, promote and maximize revenue and profits. CHOOSE AXISES THAT ADDRESS KEY STRATEGIC ISSUES: If you want data to provide answers, you have to set it up by addressing the right questions. How you choose and define your axises serves as a primary guide. The chart below plots software companies based on based on their “vision” and “ability to execute.” The axises address a key strategic issue that can provide answers like likely winner and losers based on positioning and competitive advantage. The company data is telling because the criteria is clear. PROVIDE A USABLE LEGEND: The definition of the legend plays an important role in motivating action. The data visualization below of expenditures per student for New York state schools offers a telling picture of where education monies are going, what are areas of greatest need and how they might be redistributed. ESTABLISH SEGMENTATION: If you want actionable insights from data, it helps to establish segments or groupings that create differentiation. The chart below shows the Top 100 Entrepreneurs, divided into three segments. From this chart, it’s clear that not all entrepreneurs are created equal. 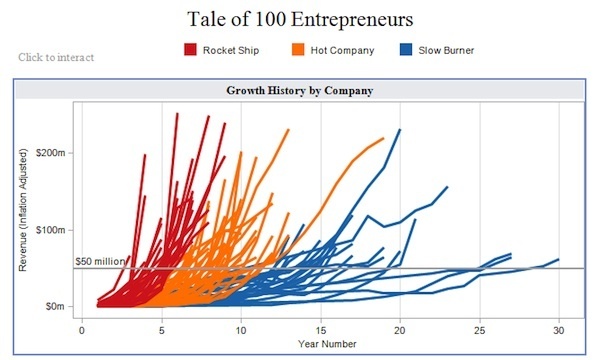 If you want to understand what makes great entrepreneurs, the data tells you to focus on the “Rocket Ship” segment and probe into what makes them tick. FACILITATE DISCERNMENT WHEN SHOWING A TIME SERIES OR GEOGRAPHY: When showing time or geography, incorporate colors, coding, history or forecasting to provide perspective or context that shows where things are headed. 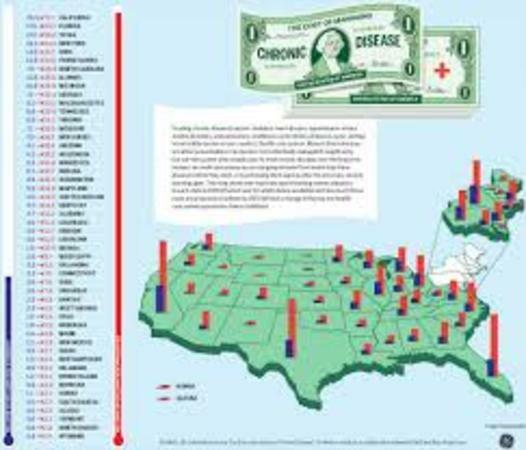 The “stacked graph” below on unemployment in the US by industry (time series) and the cost of chronic disease care (geography) show how how to display time series and geographic data, effectively. IDENTIFY CLUSTERS: When looking at many variables, use clusters to show the data in ways that creates groupings that lead to conclusions. 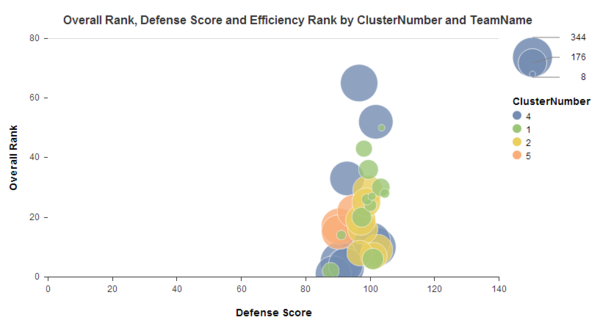 The Cluster Analysis below was created to identify the college basketball teams that were most likely to win the NCAA’s based on defense. As you can see, clustering the many variables that were examined helps to clearly show the teams that have the most potential. TELL A STORY WITH THE DATA: Good data analysts are storytellers. Effective data visualization is often helped with text. Simple headlines or text boxes help explain what the data is saying and the actions that should be taken. This example below from Avinash Kaushik, Digital Marketing Evangelist at Google, shows how data visualization might be presented to the C-Suite. 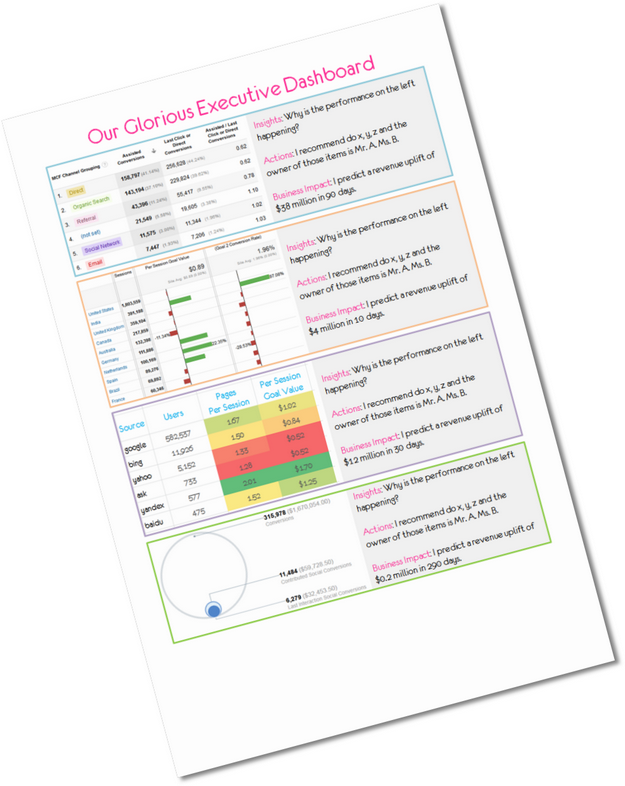 CREATE AN ACTIONABLE SCORECARD: The data dashboard your company creates should be based on Key Performance Indicators. KPIs are one of the most over-used and little understood terms in business development and management. They are too often taken to mean any metric or data used to measure business performance.The role KPI’s play is much bigger and more important. In fact, KPI’s are one of the most important guideposts for any business. Every business should have them. Here’s one of the best definitions I’ve heard: KPI’s are an actionable scorecard that keeps your strategy on track. 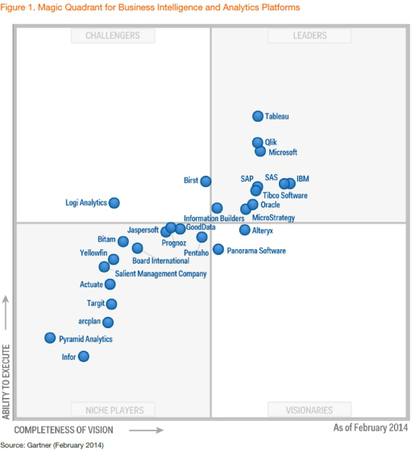 They enable you to manage, control and achieve desired business results. 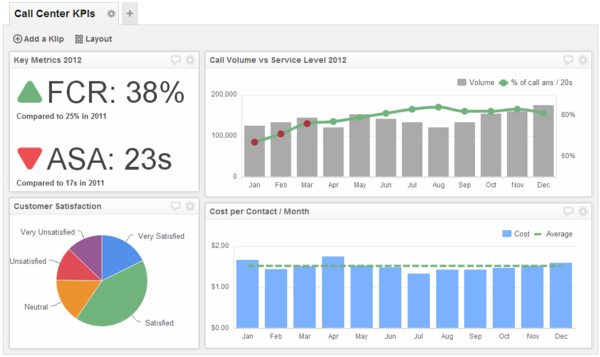 The KPI dashboard below for a call center is simply laid out, easy to understand for decision making and incorporate a little from each of the previous critical components. If your business needs help using data to make better decisions and ROI, consider BarnRaisers, because that’s what we do. Or, considering taking a Mini-MBA from the Rutgers Business School Executive Education where I teach Measurement and ROI. 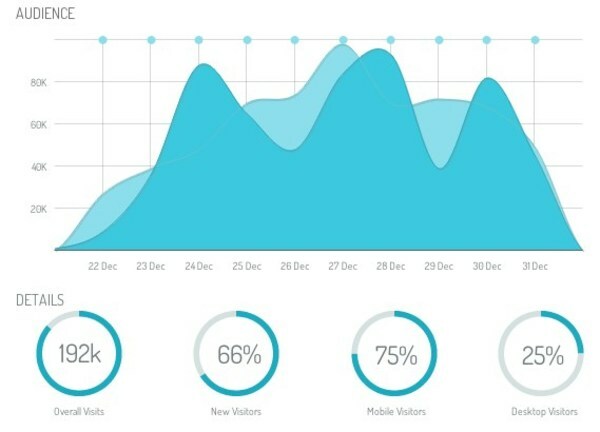 Do these key components help you see how data visualization can help your business? Native Advertising is not a new idea. Advertisers, publishers and marketers have created numerous offerings that blend branded advertising with editorial content. 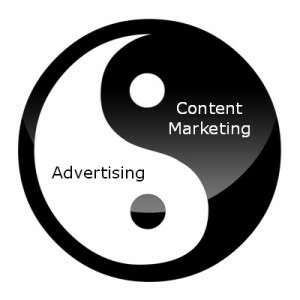 In the past, there have been media properties like advertorials and e-zines. They had their day in the sun and then faded into the sunset. Is Native Advertising, like its predecessors? Or isn’t it? Native advertising is a concept encompassing both an aspiration as well as a suite of ad products according to the Interactive Advertising Bureau (IAB). This aspiration is advertisers and publishers aspire to deliver paid ads that are so cohesive with the page content, assimilated into the design, and consistent with the platform behavior that the viewer simply feels that they belong. IN-FEED UNITS: Is in a publisher’s normal content well; is in story form to match the surrounding stories and allows for an individual to play, read, view or watch without leaving to a separate page. SEARCH ADS: Present their content in a format and layout that is readily available to organic search engine results and links to a page like the organic results. RECOMMENDATION WIDGET: Is a form of native advertising where an ad or paid content link is delivered via a “widget.” A common recommendation widget unit is integrated into the main well of the page, does not mimic the appearance of the editorial content feed, links to a page off the site. PROMOTED LISTING: Is found on sites that typically do not have a traditional editorial content well, they are designed to fit seamlessly into the browsing experience, are presented to look identical to the products or services offered on a given site. CUSTOM/CAN’T BE CONTAINED: There is no limit to the possibilities when an advertiser and publisher work together on custom units. This group includes examples that don’t neatly fit into one of the above groups, or, as in the case of custom playlists, are too platform-specific to warrant their own category but need to be on a marketer’s radar as native advertising options. The IAB is conducting a special E-course on Native Advertising in August. There will be three different courses; one on August 5, 12 and 19. I’m teaching this E-course. But is Native Advertising going to stick around? 12 experts tell us if Native Advertising is or isn’t here to stay. Native ads can be effective if there is a solid strategy behind them and the ads are measured appropriately. With many large websites making a majority of their revenue from native ads, it looks as if they are here to stay. – Alison Blumer, Ine. Do you believe Native Advertising is or isn’t here to stay? Will you be attending the E-course on Native Advertising from the IAB?